Map showing the location of Rungrado May Day Stadium in North Korea. i too am wondering how dis stdium can be d largest in d world!! anyone know's which contractor was used? 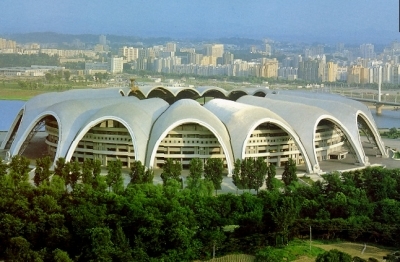 i reckon the north koreans are lying about the capacity because if you look at the pictures of the inside of the stadium it doesn't look anywhere near as big as the others in the top 10! I saw only Peoples Palat in Bucharest as big as this! such a waste! Huge stadium which i would like to visit but i cant see that happening? I tried looking up the cost of this stadium but like everything in North Korea - secret squirrel!!! how much did it cost to build it? it was built by a country and not by private investors. i'm wondering how can this stadium is bigger than the camp nou stadium. You have the ability to request en edit to any of the details of Rungrado May Day Stadium. You can do this by clicking on one of the options below.